According to a retrospective case-control analysis by Taunton et al, of the 2,002 running-related injuries seen at a primary care sports injury facility, 42.1% (842/2,002) were knee injuries. Of these knee injuries, 39.3% (331/842) were due to patellofemoral pain syndrome (PFPS), which made PFPS far and away the most common diagnosis found in this large-scale study. Additionally, an older study done in 1984 showed similar results. Devereaux et al found that over a five year period, 137 patients presented with PFPS, which accounted for 25% of all knee injuries seen at this sports injury clinic. These two studies were conducted 17 years apart, giving support to the consistently high prevalence of this disorder, but the real question is, how are we treating these patients? Based on a biomechanical study completed by Lieb et al in 1968, the vastus medialis obliquus (VMO) has been the mainstay of most physical therapy protocols for PFPS. This study helped to identify the fiber orientations of the quadriceps musculature and the functional significance of these orientations. It was found that the VMO’s fibers were oriented at 55° from the longitudinal axis of the femur which, based on orientation alone, makes it the primary restraint to lateral subluxation of the patella. Due to the discrepancy in mechanical advantages, it was postulated that the VMO was able to counterbalance the pull of the much larger vastus lateralis (VL). An insufficient balance between the VL and VMO has long been considered the primary contributing factor in developing patellar subluxation or mal-tracking. Additionally, Cowan et al found that subjects with PFPS have an imbalance in VL:VMO timing. They found that the VL typically begins to fire approximately 15-20 ms prior to the VMO. Due to this understanding of the biomechanics involved, the physical therapist’s treatment strategy typically involved correcting the potential VMO atrophy, hypoplasia, inhibition, and/or impaired motor control. Now, this all seems logical in theory, but can we actually selectively train the VMO? And does this relatively small muscle actually have the impact that we have all been led to believe? Cerny et al evaluated the ability to preferentially recruit the VMO during 22 different quadriceps exercises. It was determined through electromyographic analysis that VMO activity was not higher in any exercise in relation to the VL. Song et al conducted an RCT that found the attempted isolation of this small segment of the quadriceps was not supported. They compared the change in VMO cross-sectional area (CSA) after 8 weeks of unilateral leg press and unilateral leg press with subsequent hip adduction. It was found that there was no significant difference between the change in VMO CSA between the two groups (the standard leg press actually yielded better results). Due to this fact, selective isolation of the vastus medialis obliquus in everyday clinical practice is highly unlikely. In all reality, based on the inability to selectively recruit their target, most of these ‘VMO programs’ are no more than a general quadriceps strengthening program. If it was actually possible to selectively recruit these fibers, according to Grabiner et al, it would take approximately 60% of maximal voluntary contraction to stimulate hypertrophy of the VMO. In 2010, Bennell et al investigated the efficacy of VMO retraining in relation to vasti onset compared to a general quadriceps strengthening program. The VMO retraining group used EMG biofeedback during isometric VMO contractions at 90° of knee flexion, standing mini squats to 40°, isometric contraction of the VMO in combination with hip abduction and hip external rotation during an isometric wall contraction in standing, and step downs (don’t get me started on step downs…). The quadriceps group performed isometric quad sets, straight-leg raises, SAQs, and side-lying hip abduction. 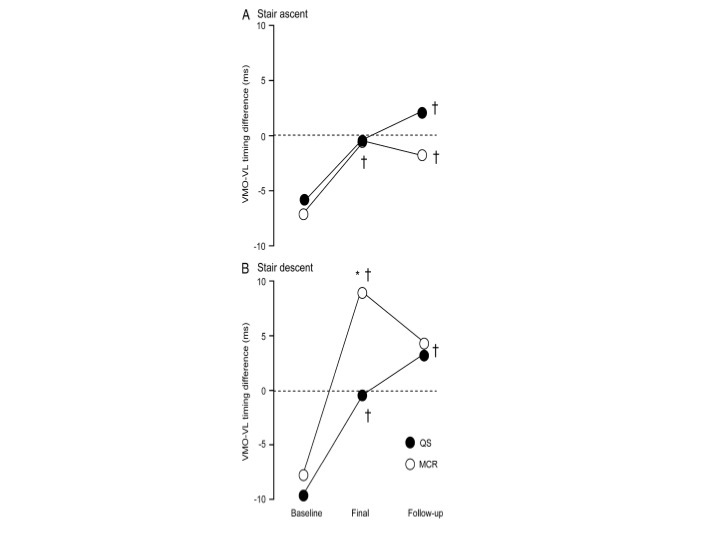 At the conclusion of the training programs, the retraining group actually does create more significant changes in stair descent activation in the short-term, however at the 8-week follow-up, both values are nearly identical. The initial improvement may have been due to the use of ‘step downs’ in the retraining group, which most closely simulates the functional and muscular demands of stair descent. During stair ascent, on the other hand, the quadriceps strengthening group caused a much more significant alteration in VMO:VL timing and was the only group that caused the VMO to fire prior to the VL. A study conducted by Laprade et al also showed similar results, but this time utilizing isometric exercise. This study looked at the EMG activity of individuals with PFPS compared to asymptomatic controls during 5 isometric exercises. There was no significant difference in the ratio of VMO:VL firing between the two groups. Given the results of these studies, I find it hard to support the use of VMO training during everyday clinical practice. Lets say that, theoretically, it was possible to selectively recruit the fibers of the VMO… Would this result in sufficient reductions in patellofemoral contact stress to relieve the pain associated with this diagnosis? A study done by Sawatsky et al says no. This was a biomechanical study utilizing New Zealand white rabbits. While this is not a direct human study, the muscular alignment/pull of the quadriceps is very similar in that the fibers of the VMO are oriented at approximately 45-50° and the VL is oriented at approximately 14-19° with respect to the longitudinal axis of the femur. Measures of patellofemoral joint contact pressures were taken before and after transection of the VMO at varying levels of knee flexion (30°, 60°, and 90°). At the conclusion of the study, it was found that there was no significant difference between peak pressures, average pressures, contact areas, or contact shapes between pre and post-transection. If the contact area and pressure is not altered when the muscle is removed from the equation, then why do we continue thinking VMO training is the gold standard in PFPS treatment? So… then what causes and what is effective in treating patellofemoral pain syndrome? Over the coming weeks, I will provide theories on underlying pathology/impairments and their subsequent treatment strategies… So stay tuned! Please get started on step-downs–I’m curious! I apologize for the delayed response… I somehow missed your comment! Chinkulprasert et al (http://www.ncbi.nlm.nih.gov/pubmed/21289449) investigated the patellofemoral loading differences between the forward step-up, lateral step-up, and forward step-down exercises. The forward step-down exercise elicited significantly greater average patellofemoral joint stress and peak patellofemoral joint reaction forces. Patients and their knees don’t typically like that! Also, anecdotally, as both a patient and clinician, I have noticed increased patient discomfort when using this exercise. hi is the follow up article alr done up? 🙂 very very informative and helpful article! thanks for the write up!